Best Soundbars 2019: Soundbars are what we normally use when we feel that the TV that we have purchased does not have the same sound levels we hoped for when we bought it. It is a rather simple and old story actually: the TV you have bought looks great and is an ideal device for your living room. 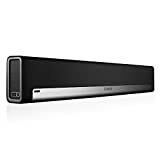 The same, however, cannot be said for its sound which can be low and hard to hear at the best and can be downright disappointing at times, This list of the best soundbars of 2019 is intended to provide you with a list of all the models which you can consider buying. Sonos Playbar – Sound Bar for TV to Wirelessly Stream from your TV or smart device. Works with Alexa. As you already know, there are many manufacturers of soundbars. That said, not all of them are worth either your money or your time. We have managed to sift through the vast majority of all these bars and settled on the following top sound bars of 2019 which are guaranteed to please and surprise you. What’s more, we have also devised a brief buying guide at the end of the list to help you pick the best-suited soundbar for you. This is the best soundbar for Samsung TVs as well as being the most premium soundbar on this list. The Samsung HW-K950 is one of those rare models that exceed your expectations and blows you away. This is also the best soundbar with Dolby Atmos. The sound that it is capable of delivering is other-worldly and seriously great. We managed to lay our hands on one of these units last month after a great deal of parsing through similar premium products. And we were not disappointed. The main reason why we chose this specific Samsung model is that there are not too many models with Dolby Atmos support that are currently available in this price range. The setup delivers perfectly tuned 5.1 4-channel sound from all sides to take this soundbar above and beyond most such devices. This Samsung model is very easy to set up and requires a simple HDMI connection. The surround sound as emitted by the HW-K950 is superb. It is true that the mid-range sounds could have been a bit better. However, as far as it comes to both the low-frequency sounds and the higher-spectrum sounds are concerned, this is clearly the best soundbar of 2017 as well as of this year. The wireless satellite speakers are also provided, although they must be plugged into a different source of power. Once plugged in, these provide an additional level of surround sound. The very fact that Samsung has managed to bring a Dolby Atmos soundbar in such a small form factor is something which never ceases to amaze us. One major gripe that we have is that the device lacks authentic DTS:X decoding. In case you missed it, DTS:X decoding is the official Blu Ray sound format. While Samsung has turned to the rival, Dolby, the Atmos experience is certainly one that you should aim for at least once. You will not be disappointed. Surround sound output is par excellence as well. Overall, this is certainly the best Soundbar of 2019 if you can afford it. For those who want to experience the full range of the Dolby Atmos experience in a simple system, this is the one that they can always rely on. The form factor too is great to look at and Samsung clearly has ensured that the user gets the best sound experience without the need to remodel the living room. There can be no list of any audio products without the mention of Bose. The Bose Soundtouch is the best Bose Soundbar under $700. It is also the most aesthetically pleasing of all the available models and can also rule the roost as the most good-looking soundbar. The Bose SoundTouch is not only capable of producing superb sound, it also looks great and adds to the appeal of the room it is situated in. The Bose SoundTouch 300 breaks one of the myths that surround the company itself: that all of its products are overpriced. The first thing we noticed when we turned this baby on was that it was capable of reproducing even the low-end sound output in all its entirety and fullness. This soundbar also has an included subwoofer. Despite that, the dialogue output is superior to most other devices. The soundstage that Bose provides is immersive and extremely good-looking. The device also provides Dolby Atmos support which makes the sound output that much better. The Atmos support also provides state-of-the-art surround setup. It must be mentioned that this Bose model is not too good as a standalone music device. Luckily, we have one or two devices on this list that can act as decent substitutes. Purely judging by the cinematic sound output, the Bose model is one of the top soundbars of 2019. 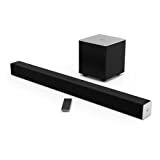 The dimensions – 38.5 inches wide, 2.25 inches tall, besides 4.25 inches deep- do not make this a mini soundbar; however, it is still remarkably svelte and can fit under a TV with ease. The icons are simple and have recognizable LEDs. 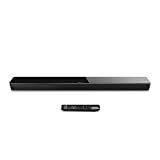 If you are looking for a soundbar which has an amazing design, this Bose model is ideal for you. The state-of-the-art surround sound capability combined with its very generous dollops of full-natured output make this easily one of the best 2019 soundbars. The latest model also comes with Amazon Alexa support and this is actually a blessing in disguise. Up next on the list is the Sonos Playbar, often stylized as the PLAYBAR. The Playbar is the best soundbar under $700 on this list. Sonos is not only one of the most famous audio companies in the world, it is also a leader in the R&D segment. To this end, we believe that this model is also the best multiroom soundbar with its robust streaming systems. Perhaps the best thing Sonos is universally known for is its multiroom functionalities. This model is no different. Working equally smoothly with TV as well as music, this model is also the best soundbar with Alexa support. For, although many other models also use Alexa support, Sonos does it the best. The Playbar integrates neatly (and easily) with Sonos’ multiroom system. The same multiroom support also lets you enjoy the services of the Playbar as Internet-connected speakers. Setting the device up is very easy: there are just two wires, where one has to be hooked to the power source while the other needs to be hooked onto the TV. One more thing: the device is shipped as a 3.0 unit. It can, however, be hitched with the help of Sonos’ other speakers like Sub and Play:1 to upgrade it to a 3.1 or 5.1 surround sound system. Such upgradations can, however, be costly. One more thing: while the company claims that this device can be controlled via your existing TV remote, we recommend that you use the Sonos app from your smart device. This leads to easier and better control. Overall, the Sonos Playbar, although names as a TV soundbar, is also a great choice for streaming music wirelessly. 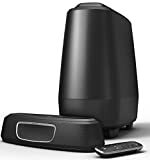 This multiroom support that the company provides is a much-appreciated one and something that is made even better with the addition of Alexa. Ask Alexa to start playing your favorite music in your bedroom as you finish your luxurious shower- all thanks to Sonos. It is a universally respected concept that the price of a device plays a significant role in people’s minds when making a purchase. For the budget-conscious customer who wishes to purchase the best soundbar under $150, the Vizio SB3821 soundbar is an automatic choice. The Vizio device offers an excellent and enveloping sound at an astonishingly low price tag, something that very few rivals do. The Vizio SB3821 is also one of the best minimalist soundbars. As far as the features and the sound quality are concerned, the Vizio product can easily match some of the more expensive devices. Ask it to decode the basic DTS and Dolby formats and it will do so with ease. Connecting this Vizio model is easy thanks to multiple options like Bluetooth, a 3.5mm Aux-in input, USB, besides coaxial, and optical digital inputs. At this price range, Vizio has also managed to pack in a wireless subwoofer, something that no best soundbar under $200 is capable of. The device also comes with its very own wireless remote which allows for conveniently changing the volume, as well as the input and audio controls. These aids are remarkably convenient as is the wireless subwoofer, which works extremely fine. To be fair, not everything is quite hunky-dory; the display lights are no good and are of hardly any help. Do not be distracted by that petty issue: at this price, there is hardly a worthier opponent. Barring a few issues, the Vizio model is indeed the best budget soundbar of 2019. Even an audiophile or an audio professional will be hard-pressed to identify the difference that this device’s sound output has from that of other comparable devices. Together with the fact that there is support for a 3.5 mm jack, we believe that this is the first soundbar that you should buy- if only to refine your tastes. Looking for the best smallest soundbar of 2019, are you? The Polk MagniFi Mini is easily your best bet. This is also the best compact soundbar of 2019. The device combines the great sound output that Polk is known for in a simple and relatively uncomplicated form factor and a very small case. The Polk MagniFi is about as small as they come but operates extremely well. The device is easily one of the best soundbars under $300. While at first glance, it might appear to be a speaker more than a soundbar, this is a dully functional soundbar with all the frills. If you really want to know how small the device really is, think of it more like a loaf of bread. Now, combine that loaf of bread with the great sound output of most modern soundbars and you get the MagniFi. The device packs in its own wireless subwoofer and a 6.5-inch downwards-facing driver, both of which then team up to get the maximum sound possible for so small a device. While we were using it, we were stunned by the fact that the Polk model could also handle bass-heavy moments with ease. The size also tends to lend some rather avoidable bits too. While Polk claims that the device is capable of a 5.1 output, in pour experience, we found that this was closer to a 3.1 speaker. That said, with so much emphasis placed on the price factor nowadays, the very fact that even this 3.1 output sounds better than most comparable (and more expensive) devices makes the MagniFi worth every penny. Overall, in case you are on a lookout for a small and compact soundbar capable of delivering an extremely rich sound, this is the model that you should go for. The frank truth is that in this price range and in this form factor, this is as good a device as money can buy. We highly recommend that all beginners in the field of soundbars should start with this model. Not too many people know that the LG SH7B is definitely one of the most flexible soundbars that currently exist. When we say flexible, we are not talking about the physical flexibility but the flexibility with features that this device boasts. This device is for those who want to have control over and customize their devices, besides being reasonably fair as far as the sound output is concerned. This device falls in the best soundbars between $300 and $400. One great feature which the SH7B has it its Wi-Fi compatibility. While most soundbars are manufactured for their cinematic sound amplification abilities, this model is also great for streaming music. What’s more, this device also supports a number of connection types: including HDMI, digital optical interface, 3.5mm, as well as Bluetooth. This all-around nature is what we tried to suggest when we were talking about the flexible nature of the device. The fact that the device is also Ethernet and Wi-Fi compatible ensures that it works with your home network for streaming music among other things. Using LG’s own proprietary MusicFlow system, you can also hook up this device to other LG devices. LG has also provided a rather unique-looking remote which can expertly adjust and tune the subwoofer, treble, and bass levels very minutely. The easy EQ fine-tuning feature is something that we admire greatly. Thanks partially to the LG MusicFlow system, we can say with some assertion that this is one of those devices that, while not heavily advertised, delivers more than is promised. Besides, the great amount of control that the user has at his or her fingertips also makes this LG device one for all purposes. Overall, this is one device that has never failed to impress us. Sony is another one of those companies whose products manage to enter every list of gadgets. The Sony HT-ST5000 proves that the Japanese giant is not messing around as far as splendid soundbars are concerned. This is one of the best Dolby Atmos Soundbars of 2019 and is one of the products which the most advanced users will like. This model is, arguably, the most feature-laden product that Sony has ever produced. Especially as far as soundbars are concerned. The device is High-Res Audio compatible and also boasts of a stunning four HDMI ports. Clearly, if you have just bought a giant TV and you would like to play around with the sound a little bit, this is one of the devices that you should consider. The Sony HT-ST5000 is definitely one of the best soundbars of 2019. Period. The few months we have been using this model (we bought it in November 2017), we have never been disappointed once. Its rich sound output always manages to keep us on our toes. Once you take into account the fact that it actually looks extremely handsome too, this is where we realize that Sony does have a winner on its hands. One of our keenest members even tried to peel back the screen and found gold-trimmed speakers! Although we do not know if that solves or helps in any way, this is easily the soundbar to go for in case you want to splurge. All in all, this Sony device is easily one of the best soundbars 2019. 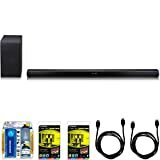 Sony has taken care to ensure that the device is not only one that will be the ideal soundbar but will also be quite pleasant to look at. Sony has also ensured a better-than-most warranty period for its device so that its more loyal customers are not disappointed. Since most soundbars are complicated, expensive gadgets, there are certain criteria that they need to fulfill in order to stand out from the crowd and be truly exceptional. Basically, since the dawn of the flatscreen TVs, the sound quality simply hasn’t caught up with the picture quality that is provided. A soundbar is preferred over the average home theater precisely because many speakers are boxed in a long device and does not take up too much space. Now for the buying guide. Besides certain mandatory criteria like rich sound output and an impressive bass and treble reproduction, watch out for the following criteria. Wide Listening Angles/High Maximum Volume: Most soundbars have something that the experts call a ‘sweet spot.’ While this may sound like it is actually a good thing, unfortunately, it is hardly so. This is the spot where the sound output is the best. The further you move away from this spot, the worse the sound becomes. It may sound paradoxical, but it is so. Ideally, the ‘sweet spot’ is located right in front of the TV set and a few feet away from it. If you have to frequently change positions (like we all do when a family is watching the TV), you must scrutinize the ‘different angles and distances’ scores that are written in the instruction manuals of each of the manufacturing companies. This will also show how versatile the soundbar is even if you are a bit removed from the source of the sound. Also, we have experts confirming to us that whenever you buy a soundbar, always test the maximum volume. If there is no distortion even at the highest volumes, buy that device immediately. Good Quality Connections: Being naturally expensive devices, it stands to reason that the attention to details also is up to the mark. Any self-respecting soundbar manufacturer will incorporate at least one digital connector: at least one digital connector: an optical, a coaxial one, or HDMI. The best of the lot normally have more than single HDMI port. These input ports are included on the best soundbars of 2019 for the simple reason that they offer greater quality than the standard 3.5mm jacks. Of course, many best budget soundbars do have the 3.5mm jacks. They still have some functionality. At the price points in which these budget devices are found, it is but natural that all the slightly more advanced connections will not be available. Wireless Connectivity: Wireless connectivity is an absolute must-have these days. They not only aid in the usage of the device across rooms but also help in ensuring that you can stream music from any room to any part of your home. Remember that most of the modern soundbars nowadays have Bluetooth in addition to the more traditional options. One great advantage of wireless connectivity is that you can also use the device without even turning on the TV set. Besides, if you truly want the multi-speaker, multi-room music system setup, the wireless connectivity option is most important. Ease of Use: Like all modern devices and gadgets, the most popular soundbars of 2019 too have sophisticated user procedures. Most manufacturers ensure that not only the experienced but also the beginners in the market are able to use these devices. Ease of use encompasses not only the device itself but the paraphernalia that come with it. For example, the remote control units. These are often very small in size and the buttons are tiny. Ensure that you get proper parts so that you do not face any problems. A bigger soundbar can actually block the remote’s signal to the TV and can be a distraction. To negate this, there are some quality soundbars which actually have IR repeaters. These help in ensuring that the remote works properly. While some of the best soundbars of 2019 do have easy to use LED lights, many of the gadgets do not have these features. Make sure that the one you buy actually has these features. Attractive Design: Since these soundbars sit in front of the TV, they might as well be good-looking. Ensure that the interface is clean and decently attractive so that these devices prove to be a complement to the TV instead of being a distraction. Added Features: While certain added features are present in most of the soundbars, there are certain special features that only the best models have. The subwoofers, for example, are often bundled not with the particular device but may come as an external accessory. This means that you will have to take care of an additional device as well. You might ask why the need for the subwoofer exists since the devices themselves have so much quality sound. Well, the reason is that these subwoofers add to the bass boost and also amplify the lower ends of the sound spectrum. Besides, nowadays, external subwoofers have been made wirelessly connectible, which is why we recommend that if you have the budget at your disposal, you can go for the subwoofer.